Xiaomi has always been known for making great phones which boasts of a great hardware and that too at a very affordable price. This strategy has helped them grow at such a rate in past one year. Recently, they launched the Redmi 5A, marketing it as “DeshKaSmartphone”, the successor to the last year’s Redmi 4A. So in today’s post I’ll show you that how to root Redmi 5A and use Pixel 2 Camera to capture some amazing blurred background images from the front camera as well as the rear camera. The Redmi 5A comes with great hardware including the Qualcomm Snapdragon 425 Chipset, which is a Quad-Core Chip which four ARM Cortex – A53 cores, a 5-inch HD (1280 x 720) display with a pixel density of 296 ppi. The phone comes with either 2GB RAM with 16GB of storage, or with 3GB RAM with 32GB of storage. A considerable change here in this phone is that It comes with a Dedicated Micro-SD Card slot which can support upto 128GB memory card, like the Redmi Y1/Y1 Lite. The Redmi 5A comes with MIUI 9, Xiaomi’s own custom Skin built on top of Android 7.1.2 Nougat. According to them, MIUI 9 is faster in terms of performance than the previous MIUI 8. The hardware and the software of this device is nowhere underpowered or insufficient considering the price at which it is launched. This means that it is much more capable what you might think. And If you don’t believe me, then hold down your breath, Because what I’m going to tell you will blow your mind. Yes! I’m serious. From a past few months, XDA developers have been extensively working to Port the Pixel 2’s Camera app for other devices. Initially, it was working for Snapdragon 8xx devices, but now there are so many versions available for the same. It is found to be running on the Snapdragon 6xx devices like Snapdragon 625, Samsung’s Exynos’ devices. The surprising element here is that a version of the Pixel 2’s Cam, i.e., GCMod 5, Ported by the XDA developer Arnova, is working on the Redmi 5A. Yes, it is working. Isn’t that awesome, Right? Well, thanks to these developers who work tirelessly to bring us these mods and ports which enables us to use features of flagship devices even in the budget devices. That’s the best part about Android. So, you might be wondering how to use that Pixel 2’s camera on your Redmi 5A. You must be eager to take Portrait Shots from your Redmi 5A and of course, those beautiful Portrait Selfies because why not. Well, it’s certainly possible but you need to put in some efforts, some valuable time of yours into this before you can actually start to use the ported camera app. So, I’m going to tell you how to enable and use the Pixel 2 Camera, step by step. The Pixel 2 Camera needs Camera2API enabled in order to function. Else, it won’t work at all. Since, the Camera2API is disabled on Redmi 5A by default, we need Root Access to enable it. That’s the only method to make it work. Firstly, we need to flash TWRP Recovery. It is a very useful recovery which helps in backing up data, flashing zips seamlessly. And to do that, we need to unlock the Bootloader first. 1. Go to Settings in your device -> About Phone. Find the Build Number and tap on it 7 times to enable Developer Options. 2. Now return back to Settings. and go to additional settings, You’ll see an Option of “Developer Options” down below in your Settings. Open it. 3. Find the option “OEM Unlocking” and enable it. Also, enable the “USB Debugging” option. 4. Now, Download the ADB drivers in your PC and install them. These drivers are must to make your device communicate with PC in the fastboot mode. Now, Once your bootloader is unlocked, we can flash the TWRP recovery. Download these files. TWRP Recovery, (twrp-3.2.1-0-riva.img) Latest ADB Folder, Magisk.Zip file, LazyFlasher.zip and Magisk Manager APK and i would suggets you to put all these files in the same folder on your desktop and then Copy Magisk.Zip LazyFlasher and Magisk Manager APK to your Redmi 5A's internal storage. Now Extract the Latest Platform Tool (ADB Folder) using Extract to option, and you will find a folder with the same name, open that and you will find one more folder just open that and you will see some files and folders over there, now go back and copy the twrp-3.2.1-0-riva.img file and paste the file into the adb folder, where you have seen some files and folders. 1. Make sure you have backed up important files. Although there is no data loss, but it’s better to be safe. 2. Now power off your device. 3. Once it is Off completely, Press the “Power” + “Vol Down” buttons simultaneously to boot it up in the fastboot mode. Hold them together until the device vibrates. 4. Now you will see the Bunny logo and fastboot text written on the screen. Now, connect your device to your PC via the data cable. 5. Now open the ADB folder in your PC. Hold the Shift key and right click anywhere in that folder itself. 6. You will get a option like “Open Command Window here” or “Open Powershell here”. Click on that. 7. Now we need to type in a few commands to flash the twrp recovery. now it wil display you some random strings on you laptop, that means it has recognized you redmi 5a. now it will boot your redmi 5a into twrp recovery, now in the first screen just swipe right to confirm. 2. Press the “Power” + “Vol Up” Key together to boot it up in the Recovery mode. You will see the TWRP logo. 3. Now you will see the main TWRP screen where all the options are available. 4. Go to Install -> Browse the Magisk zip. Select it. Swipe to Confirm. The Magisk will flash now on your device. 5. Once done, choose Reboot System option. 6. Your Device will reboot now. now Install the magisk Manager APK which you have already downloaded and open it once and just close it. 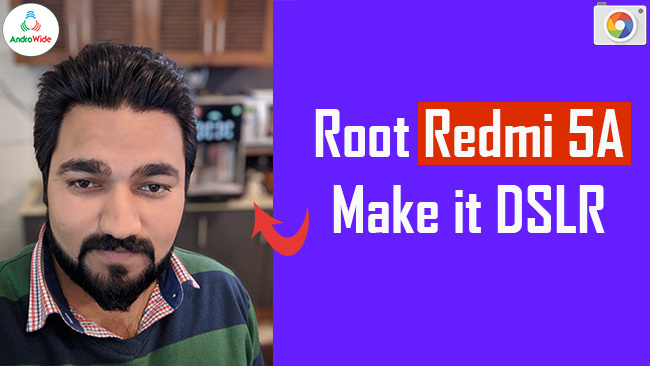 so now you can check with the root checker app that your redmi 5a is rooted or not, i am 100% sure it will show you that your redmi 5a is rooted successfully. so now if you want to use Google Pixel 2's portrait mode camera to capture some amazing bokeh images you will have to enable Camera2API, follow the steps shown below to do that. 1. Open the play store and download the Build Prop Editer application. 2. Open the app once installed. It will ask for SuperSU permission. Click Grant. 4. Now, Install the GCam apk. If asked to grant Unknown Sources access, allow it. 5. Now open the application. It will be named “GCMod5”. 6. Now click on the three tile on top left and Select Settings. 7. Choose config camera HDR+ to Nexus 5X. 9. Now exit the app. Not go to Application Manager in Settings. Find GCMod 5. Click on it. 10. Find the Storage option and open it. Clear the Cache. 11. Now come back and select the “Force Close” option. Clear the app from your RAM. 12. Now launch the camera app and when you click on three tiles in top – left, you will see a “Portrait” option. Enjoy taking beautiful Portrait shots on your Redmi 5A. Don’t forget to check out our YouTube Channel for Hindi tutorials on the same. Watch the Video Tutorial of the Whole Process of this.